Play the game, throw the dice – become regionally wise! Throw the dice and move as shown by the score of the dice. You Gain tools for developing your business from each visit to a cluster. If you land in a special circle, follo the instructions it gives. The clusters represent a new way of cooperating across organisational boundaries and developing new regional value chains. 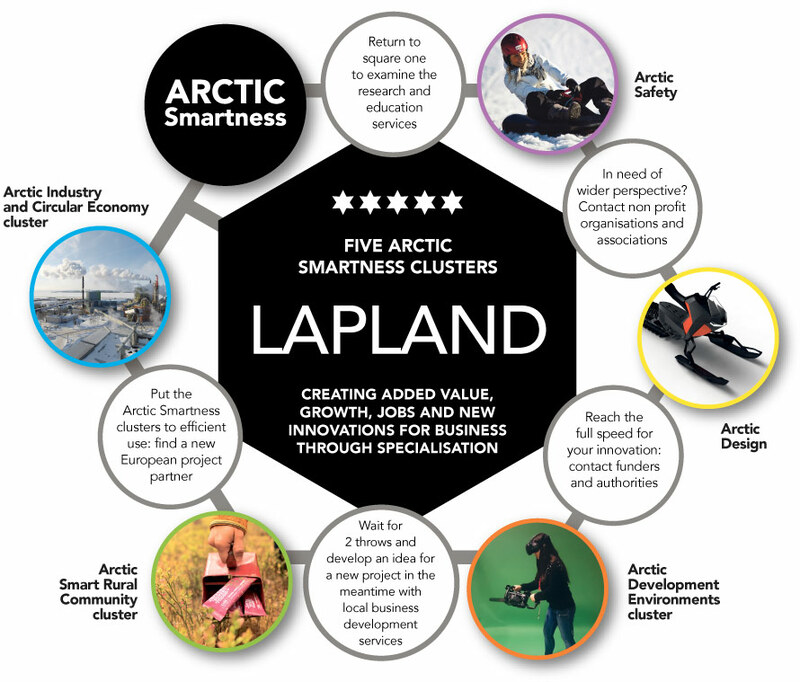 The core of cluster activities is to create growth and innovation opportunities for SMEs in Lapland. The clusters functioning in Lapland have established a firm foothold in regional development work and discovered their own networks in international arenas as well. In 2016, the five clusters of Lapland received the Bronze Label of the European Secretariat for Cluster Analysis (www.cluster-analysis.org). In 2017, the Rural cluster and the Industry and Circular economy cluster secured the Silver Label. The clusters are being continuously developed further in order to meet the needs of SMEs and cluster organisations. Already now, the cluster is seen as an ideal model in the field of rural development against global challenges. Arctic Industry and Circular Economy cluster aims to develop it’s leading position in exploiting and commercialising Arctic natural resources and conditions while maintaining balance of sustainable development. Mix of industrial expertise and commitment to sustainable development are at the core of refining natural resources in the Lapland region. We are reaching the vision by promoting regional clusters and ecosystems of emerging industries that focus on refining natural resources throughout the value chains. Base for our business is nature. The mission of Arctic Smart Rural Community is to avoid capital outflow from rural Lapland and create new innovative enterprises based on circular economy. The cleanest corner of Europe offers a surplus of raw-materials to wide-range smart resource-intensive business. Our goal is to transfer the added value of local natural resources for a benefit of the communities. Arctic Development Environments cluster is serving as a supporting network to all clusters with i.e. enabling technologies to all industries and especially SMEs. The tool for measuring the performance and effectiveness of innovations is Technology readiness level (TRL). TRL is used as a meter to indicate the level of cluster’s readiness to produce development services to the market. Smart regional specialisation makes the world class design.The main purpose of the Arctic Design Cluster is to make local businesses, products and services nationally and internationally competitive by utilising smart specialisation.The heart of the cluster is Arctic Design Centre of Expertise created by the Faculty of Art and Design of the University of Lapland. Safety through regional and interregional cooperation. The aim of the Arctic safety cluster is to strengthen interregional networks and safety business opportunities. The cluster brings together companies, authorities, research and educational organisations, NGOs, regions and towns. The cooperation is carried out in civil and tourism safety.